With the price of Bitcoin skyrocketing and with more and more people getting involved with the cryptocurrency, Bitcoin mining is generating unprecedented interest as well. While the profitability of actual Bitcoin mining has always been a contentious issue, there have fortunately always been people willing to invest in the latest technology in this regard. If you happen to be someone interested in joining the ranks of the miners yourself, you will want to take a look at Bitmain’s Antminer S9, simply because right now, it is the best Bitcoin mining equipment available. With the rising Bitcoin prices, profitability is not much of a problem these days, despite the ever-increasing difficulty. BTC’s mining environment has apparently begun to self-regulate, so miners always get what they deserve in USD terms, despite the fact that they earn ever decreasing amounts of the prized digital asset. How Much does an Antminer S9 Cost? This is where things become a little confusing, because Antminer S9 prices cover a confusingly large range. From around $1.6k, all the way to $4.1k, you’ll see Antminer S9s on offer out there, and you’ll wonder why there are such huge price discrepancies. There are apparently several different versions of S9 available, some of them capable of ~13TH/s, others of 13.5TH/s, while still others claim the speed-record of 14TH/s. Some of the price-wise inconsistencies are obviously explained by this fact. In addition to the above, you should also factor in a Bitmain power supply, which will set you back a further $180-$200, as it is sold separately. What Can You Mine with an Antminer S9? Mostly Bitcoin given how these ASICs (Application-specific Integrated Circuits) have been specifically created to handle SHA-256 hashing. Some altcoins, like Ethereum (ETH) have been conceived to be ASIC-resistant, meaning that no, you can definitely not use equipment in the vein of Antminer S9 to mine them. Although at first, your brand-new Antminer S9 may seem a little intimidating, setting it up and getting it to mine bitcoins is surprisingly easy. Let us take this one step at a time and see first what you need to physically plug into your unit. Your Antminer S9 unit arrives in a separate box. The manufacturer recommends that you give it a bit of a shake before you set it up, to check for heat sink components that may have come loose within, during shipping and handling. If everything is A-OK, you can proceed to un-boxing your Bitmain power supply and plugging its PCI-e connectors into the main unit. There are a total of 10 such connectors, of which you will need three for each of the three hashing boards of the Antminer S9, and one for the controller. In addition to that, you will have to plug your network cable into the ETH port, located on the “dashboard” of the unit. Once you’re done with that, you can connect your power cable to your power supply unit, and plug it into your wall outlet. It is important to know that your Antminer S9 will need some 1,300 Watts of power, while the Bitmain power supply unit can deliver 1,600 Watts, so you will be OK there. What Makes the Antminer S9 Tick? 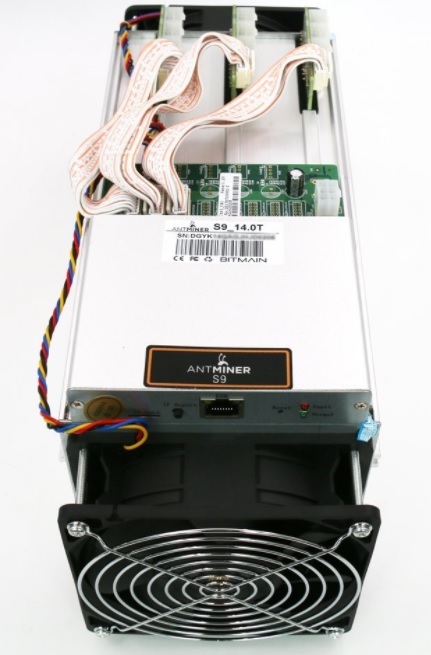 The technology within the relatively sleek aluminum alloy casing of your Antminer S9 is indeed impressive in every regard. The above mentioned three hashing boards employ 189 BM1387 ASIC Chips, which are the hashing workhorses of the unit. Built with 16nm FinFET technology, these chips use about 0.098 Joules per Gh/s, and that makes them the most efficient ASIC chips ever to see the insides of an Antminer box. The proper functioning of each and every one of these chips can be visually tracked from within the device management interface. The heart and soul of the controller is a Dual ARM Cortex A9 processor, with a Xilinx Zynq-7000 FPGA. This is the part of the unit responsible with the web-interface of the unit, and the A9, with its Gigabit Ethernet support, does indeed do a superb job at submitting the mined blocks instantly. As said above, the size and form-factor of the S9 unit is almost identical with that of the S7, even as its components put out three times the power and twice the efficiency of the S7. Two high-speed fans located at the front and back ends of the case, make sure the electronics inside are properly cooled. How to Mine Bitcoin using the Antminer? Once you have physically set up your S9, you will need to connect to it through the network, with a computer. To do that, you will need to learn the IP address of your Antminer S9. To this end, Bitmain.com offers a downloadable file, called IPReporter.zip, which contains an app that will reveal the IP and MAC addresses of your S9 unit. Within IPReporter, click the Start button and then press the IP Reporter button on the faceplate of your S9. After a few seconds, the required information shall be displayed. Simply enter the IP address into your browser, and when prompted for your user name and password, enter “root” for both. This way, you’ll have accessed your Antminer S9 configuration interface, where you’ll be able to make all the needed settings. If you have ever configured a wireless router, you will probably not have any kind of problems with this. The device management interface allows you to set a different password for your device, to refresh its firmware, to monitor its performance and to reboot it if needed. Most importantly, this is where you can make all the miner configuration settings. You are required to enter your mining pool URLs, as well as your worker names and passwords. A total of three such URLs can be used, for the primary pool and the two backup ones. If connection to the primary pool fails, the device will try to connect to the second pool and then the third. Information regarding these URLs can be found in your mining pool account. If you don’t already have a mining pool account, you could open one for free with Antpool.com (owned by Bitmain), SlushPool.com, or Pool.Bitcoin.com. Make sure you don’t choose a fraudulent mining pool, such as Bitclub.network. Once you’ve made the above settings, your miner status screen will begin showing delightfully detailed information about the inner workings of your S9 device. It will show you the number of ASICs used, the status of each of these circuits, the average frequency and the speed with which your three hashing boards take care of business. Total speed is shown too, as well as the statuses of the three mining pools. When you see all this information displayed, you are already mining. Give the system some time to get up to speed and to reach the 14 Th/s it is supposed to. How Do You Get Your Mined Bitcoins into Your Wallet? You simply have to provide your wallet address within your mining pool account. You can also set a limit there, on the amount of accumulated bitcoins which triggers an automatic transfer into your wallet. If you set say 0.5 BTCs, a transfer will be made as soon as your mined amount reaches that limit. Antminer S9 is by far your best bet if you are considering Bitcoin mining. Another thing you should bear in mind if you are planning on setting up your own little mining farm: these devices are rather noisy. You will need a separate room for them, like a garage or a shed/basement, where they won’t bother anyone with their incessant buzzing. Are you using Antminer or any other mining rig? Please share any feedback in a comment below this review. I’m interested in it. Also ‘i want to ask you about cloud mining, is it cheaper? Most cloud mining operations are not trustworthy, which led us to advise our visitors to avoid all Bitcoin mining. It will take about 15 months to mine 1 BTC using one device at the current difficult level. With 16-17 devices, you will probably be able to mine 1 BTC per month. At $16k/BTC, right now, that’s a pretty good return… If the cost of 1 S9 is $3,000, you’re looking at an initial hardware investment of $51k. At the current price, it’s take you about 4 months to ROI (electricity factored in). After 6 months, you’d be in the black and make money hard and fast. Though difficulty is set to increase in the meantime so It’s really tricky. It’d take longer than 6 mos to ROI.